Piaui magazine is a New Yorker clone — cloned in terms of content and style but unconventional in design — that has apparently declared war on the Social Democratic presidential candidate in this year’s elections. On this Monday’s edition of Roda Viva on TV Cultura, Senator Aécio Neves faced sharp questioning from reporters including Fernando Barros e Silva of Piauí magazine, who wanted to know more about rumors that Neves was a cocaine user. 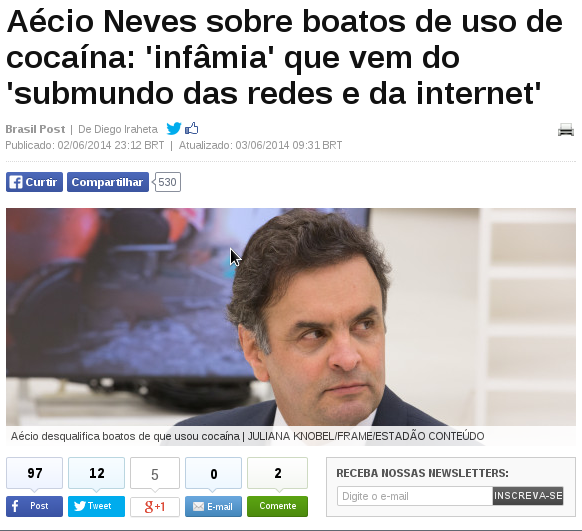 “There is no point in giving voice to what the Internet and the online underworld [are saying],” Aécio said. “No one can argue with these kinds of adversaries,” he added, denying he had ever used drugs. The interviewer cited a chant invented by supporters of the local soccer club during a match with Argentina which compared Aécio with Diego Maradona, whose biography includes episodes of drug use. As it happens, Piaui staff are currently on strike against their parent company, the Estado de S. Paulo group, and shares some kind of distribution and circulation functions with the Abril publishing group as well. Tensions have come to a head after Piauienses ran a peculiar editorial on the magazine’s online edition, The Piaui Herald, on the eve of the Neves interview. I translate a selection — a mediocre effort, but then you only get what you blog for. Sensitive to the delicate balance of national politics, the editors of i-Piaui announced this morning that they will strike for better working conditions … taking advantage of international scrutiny of the Brazilian press during the Cup, the strikers demand an end to the current assignment of shifts, the indiscriminate use of unattributed quotes, and a 24-7 masseuse to keep everyone relaxed. They want a 55″ flat screen TV with home theater and a daily work break so that staffers can swap Cup paraphernalia. Naturally, they also call for salaries proportionate to that of our publisher, Olegário Ribamar, who is traveling in Cannes and has not yet heard about any of this. Prominent Brazilians found in the pages of the Herald have backed the seven strikers of our tiny Welsh village. First on the list, Nana Gouveia says she will not return until the editors have received at least three payola checks each. José Serra has promised to sleep eight hours a night in the interim. Susana Vieira promised to write about someone over thirty, as an act of solidarity. And Ronaldo Azevinha announced that she will publish Pink Panther videos on her blog only so long as the strike endures. The publication of this note was only possible because the publisher brought in the military police of Governor Alckmin and was able to guarantee the publication of 20% of the news in cases of labor disputes. The strikers, however, are determined to take the matter to the streets to prevent the hiring of scabs and strike-breakers, of dubious morality and ambiguous practices. We are working in emergency mode.